Ever since he was a dwarfling, Borlen (nicknamed "Grump") has dreamed of visiting The Surface, so when opportunity knocks, he leaves his cavern home behind. At first, life aboveground is a dream come true. Queen Elfrieda Veronika Ingrid Lenore (E.V.I.L.) is the best friend Grump always wanted, feeding him all the rubies he can eat and allowing him to rule at her side in exchange for magic and information. But as time goes on, Grump starts to suspect that Queen E.V.I.L. may not be as nice as she seems. . . .When the queen commands him to carry out a horrible task against her stepdaughter Snow White, Grump is in over his head. He's bound by magic to help the queen, but also to protect Snow White. As if that wasn't stressful enough, the queen keeps bugging him for updates through her magic mirror! He'll have to dig deep to find a way out of this pickle, and that's enough to make any dwarf Grumpy indeed. I cannot remember the last time that I watched Snow White and the Seven Dwarves. I do remember that I did scared when Snow White was being chased in the forest and that could have been the main reason as to why I have yet to watch it again. However, reading about one of my favorite dwarves is a total different story. Following the story Grump we follow one dwarves adventures from the caves below the ground to the human world. Grump soon realizes that a person's appearance may not show their true colors. And before he knows he is befriending a young girl and quite possibly save her. This was such a heart-felt enjoyable read that just the perfect read to brighten up my TBR pile. It brought many fond memories of me sitting in front of the TV watching the old Disney movies and just really having a good time...well except when I got scared but thats beside the point. Grump is this character who although may seem a hard headed person on the outside has this vulnerability laying dormant inside. And I think that sometimes it takes that one person to really bring out the good in someone. By the end, Grump is still grumpy but I know his life was changed as well as the other dwarves. Liesl writes a lovable story that anyone won't be able to help but fall in love with. 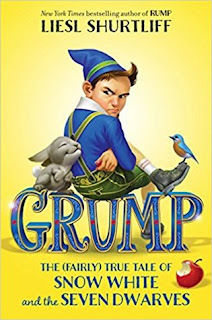 In a story full of courage, adventure, action and even true loves kiss, Grump is the perfect story to add to your upcoming TBR.